Monday, Dec 3, 2018, 4 – 6 p.m.
*The event is free and open to public. *RSVP is required. Please go to www.eventbrite.com… for registration. *For more information, please email chinauscommittee@gmail.com. The recent visit of Japanese Prime Minister Shinzo Abe was the first visit of Japanese leader to China in seven years. Both facing the pressure from an adament U.S. administration on trade and economic affairs. Beijing and Tokyo seek further cooperation, but disputes between the two countries will not fade away in the near future. How will Japan balance between an ambitious China and a hawkish America? What does this imply for Beijing and Washington? This time, the Committee on China-U.S. 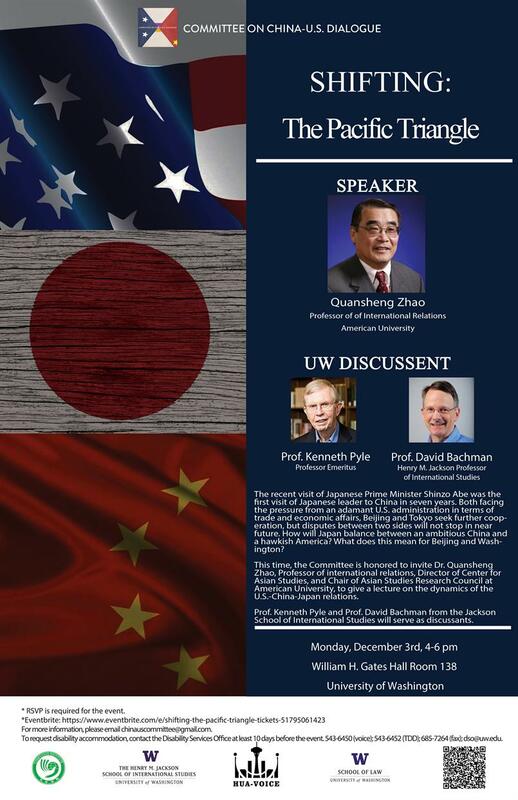 Dialogue is honored to invite Dr. Quansheng Zhao, Professor of International Relations and Director of Center for East Asian Studies, and Chair of Asian Studies Research Council at the American University, to give a lecture on the shifting between friends and enemies in U.S.-China-Japan relations. Professor Kenneth Pyle and Professor David Bachman from the Jackson School of International Studies will serve as discussants. Dr. Quansheng Zhao is Professor of international relations and Director of Center for Asian Studies at American University in Washington, DC; serving as Director of the Division of Comparative and Regional Studies for three terms (1999-2008). He is also Guest Professor at Beijing, Qinghua, and Fudan Universities in China, and Korea University in Korea, and Coordinator for the Global Forum of Chinese Political Scientists. Professor Zhao received his B.A. from Beijing University, M.A. and Ph.D. from the University of California at Berkeley. After a one-year postdoctoral research at Harvard University, he served for many years as Research Associate at Harvard’s Fairbank Center for East Asian Research. He is on sabbatical leave for the 2008-2009 academic year as a Visiting Professor at Ritsumeikan University (Japan) in fall 2008, Leiden University (the Netherlands) and Fudan University (China) in spring 2009, Chuo University (Japan) and National University of Singapore in summer 2009. A specialist in international relations and comparative politics focusing on East Asia, Dr. Zhao is the author of Interpreting Chinese Foreign Policy (Oxford University Press, winner of the Best Academic Book Award by the Ministry of Culture of the Republic of Korea), and Japanese Policymaking (Oxford University Press/Praeger, selected as "Outstanding Academic Book" by Choice). He is editor or co-editor of Managing the China Challenge: Perspectives from the Globe, Future Trends in East Asian International Relations, and Politics of Divided Nations: China, Korea, Germany, and Vietnam. His books have been translated into Chinese, Japanese, and Korean. Professor Zhao has previously taught at Tufts University’s Fletcher School of Law and Diplomacy and at Old Dominion University. He has held several distinguished year-long visiting positions (research or teaching) at the University of Tokyo, Harvard University, United States Institute of Peace, Hong Kong University of Science and Technology, and East-West Center in Hawaii. Dr. Zhao has been Series Editor of “Comparative Perspectives in Modern Asia” for Palgrave (St. Martin's Press), and a member of the editorial advisory board of the Journal of Strategic Studies, China Review, Hong Kong Journal of Social Sciences, Journal of Contemporary China, and Journal of Chinese Political Science. He has served as a member of annual peer review advisory panels for fellowships and research grants for the Woodrow Wilson International Center for Scholars, the United States Institute of Peace, the National Security Education Program, the Fulbright Program, and as an International Juror for the Grawemeyer Award for Ideas Improving World Order, as well as an external academic examiner for the City University of Hong Kong and National Chengchi University in Taipei. He has also testified on China’s economic development at the U. S. Congress.